The Connection with King Arthur to the well-known stories of Tristan and Isolde is that of Sir Tristan being a Knight of the Round Table and nephew of King Mark of Cornwall and a prince of the Cornish Land of Lyonesse. The romantic story surrounding Tristan and Isolde places Tristan as the nephew of King Mark of Cornwall. Whilst escorting Isolde, the daughter of the King and Queen of Ireland, to Cornwall to be the bride of his uncle King Mark, the couple are said to have drunk a magic potion and fallen in love. Mark and Isolde were married but the liaison with Tristran continued until all was discovered and Tristan had to flee from his enraged uncle. 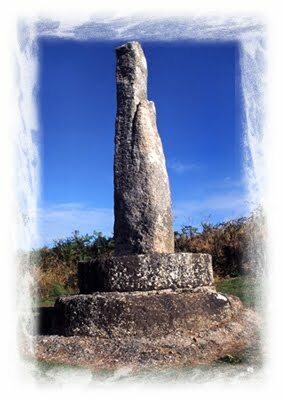 The Tristan Stone at Manabilly East Lodge Gate (SX111522) near Fowey has been moved from its original setting close to Castle Dore. The Latin inscription reads "Drustanus lies here the son of Cunomorus". Drustanus is a version of the name Tristan. Cunormorus is the name of a sixth century Cornish king who probably lived at Castle Dore. The engraved Greek Tau Cross on the back of the stone is an early Christian symbol and points to the origins of the stone being in the fifth or sixth century. Castle Dore is also given as another possibility as the site of King Mark's headquarters in Cornwall. Ninth century writings refer to Cunormorus as also being known as Marcus, presumably, one and the same as King Mark of Cornwall. Originally an Iron Age earthwork, thought to have subsequently been occupied by the Cornish Celts in the fifth or sixth century.